One of the key elements in producing good natural SEO results is the creation of a regular flow of unique – and relevant – content. Quality SEO copy tells search engines like Google that a website is of value to potential visitors. Put simply, if Google finds pertinent, useful information on your site, it will send people to it. At theEword, we provide high-quality content that is unique and relevant to each of our clients’ sites. Owing to the attention and effort we invest in the production of our SEO content, we need a dedicated team of writers; and with our recent expansion, this team has had to grow. With that in mind, let’s meet theEword’s newest recruit, 23-year-old content writer Tom Mason (pictured right). 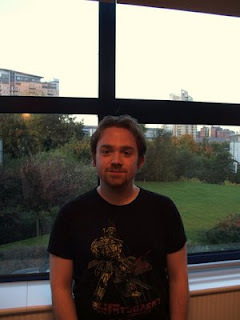 Tom joined us earlier this month, bringing with him five years’ experience as a writer. He’s previously worked for YQ Magazine and The Itchy Guide to Manchester, as well as being deputy editor at The Magazine. His freelance credits include features in The Big Issue and Virgin Trains’ Hotline magazine. Midlands-born Tom moved to Manchester to study English. In his spare time, he edits the recently launched student publication Brash, something he describes as “an attempt to wring every last drop from my time as a student in Manchester”.